For some reason I haven't posted many recipes lately (not sure why...I still cook and eat everyday), so here's a couple. One I made yesterday at home for dinner just for myself, and the other I made at work today for 180 people (but the recipe below is for just a few). Both of these are equally easy and delicious, and while I didn't make them together they themselves compliment each other, but I'm jumping ahead as I often do. The first recipe is for focaccia, or Italian flat-bread. 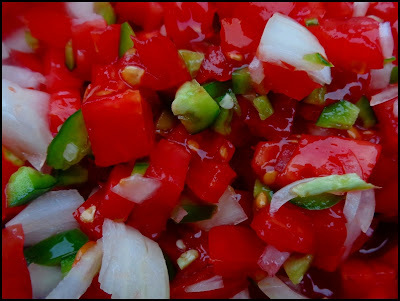 The second recipe is for classic salsa pico de gallo. I made the focaccia as an extra accompaniment for the breadbaskets on the tables today for a large luncheon, and the salsa was made with ingredients that are still growing in my garden (look at how red the tomatoes are); and I ate it as an ingredient with tacos last night (and tonight) for dinner. Etymologically, both of these recipes are interesting. Fococcia is said to be derived from the Latin word focus, which meant hearth (or fireplace) and also center, because the hearth was always located in the center of the house in those days. Hence, this flat-bread was originally baked in the coals of an open fireplace. Focaccia, of course, was the forerunner of the modern day pizza. 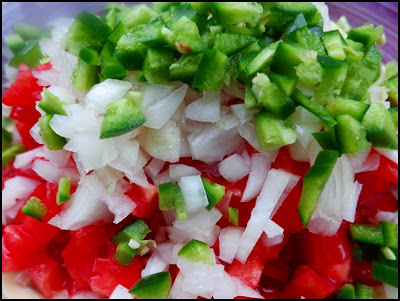 Pico de Gallo, which translates literally as "rooster's beak" (or beak of rooster) is so named because the diced vegetables are big enough (or small enough) that a rooster can pick them up with his beak. I love word origins and language in general. In a previous life I must have been multilingual. Anyhow, here's the recipes. The difference from the focaccia recipe below and the one pictured is that in the recipe I topped it with classic ingredients--rosemary, garlic, olive oil, and salt--but in the one pictured I slathered the dough with pesto. 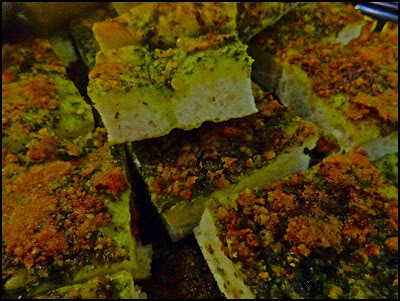 If you'd like additional images and info about focaccia being made, click here. Combine the water, 1 cup of flour, and the yeast in the bowl of an upright electric mixer. Cover the bowl with plastic wrap and allow to ferment for 1-4 hours. Add the remaining 2 cups of flour, along with 1 tablespoon of the olive oil, and 1 teaspoon of the salt. Fit the mixer with a dough hook and knead the dough for 10 minutes. Remove the dough hook and cover the mixing bowl with plastic wrap and allow the dough to ferment and rise for 1-2 hours, or until doubled in size. Gently remove the dough from the mixing bowl onto a lightly floured work surface and press or roll it to 1/2 inch thickness. Dust a pizza pan or cookie sheet with the cornmeal and transfer the dough onto it. 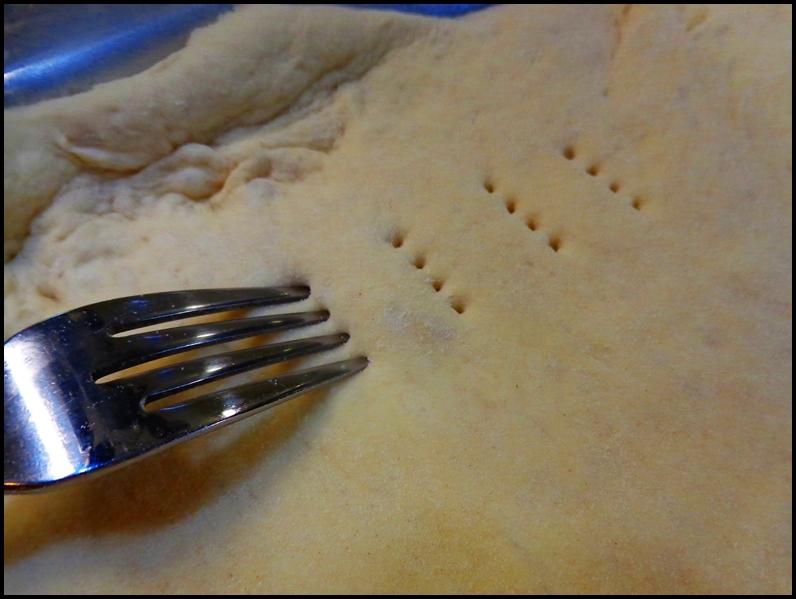 Using a fork, poke holes across the dough at 1 inch intervals. Sprinkle the remaining 1 teaspoon of salt across the dough, along with the minced garlic, and rosemary. Drizzle on the remaining 2 tablespoons of olive oil and gently rub it and the garlic, salt, and rosemary into the dough. Cover the focaccia with plastic wrap and allow to ferment and rise for 45-60 minutes, meanwhile preheat an oven to 425F. Bake the focaccia for about 25 minutes, rotating it if necessary for even cooking. When golden brown remove it from the oven and the baking pan and cool it on a wire rack or kitchen towel. Allow the focaccia to rest for 15 minutes before serving. Mix all ingredients together, cover with plastic wrap, and refrigerate for 1/2 hour.